Lamar Porter Field is a baseball park in Little Rock, AR and is the home field of the Little Rock Catholic Rockets. 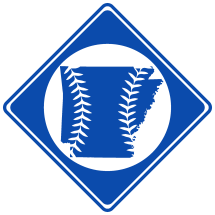 It has also hosted various American Legion baseball teams including the Little Rock Doughboys. The ballpark officially opened in 1937. The ballpark has never been used for professional baseball in its 75+ years of existence, despite being one of the nicest baseball facilities in the history of the state. The park features a covered steel and concrete grandstand, consisting entirely of green, wooden benches, suitably seating approximately 1,500. Underneath the grandstand are concessions, restrooms and locker rooms. A small scorer’s table is located atop the grandstand behind homeplate. Work began on the park in 1934 as a Works Progress Administration project. The land the ballpark is on was donated by the family of Lamar Porter, a native of Little Rock who was killed in an automobile accident in early 1934 while attending college. The park was named in his memory. Since it opened, Lamar Porter Field has been the starting place for many professional baseball players, including many who played for the Little Rock Doughboys. The most famous of these was Brooks Robinson, a Hall of Fame who played with the Doughboys at LMP in the earl 1950s. The ballpark stands today as an iconic place in Little Rock and is virtually unchanged from when it opened. On December 6th, 1990, the park was added to the National Register of Historic Places, and is well kept for that reason. Lamar Porter Field is one of only two ballparks in the state on the register, along with Taylor Memorial Field.